Dead Space 2 has been a popular showing thus far at E3 2010. At EA's press conference on Monday, executive producer Steve Papoutsis took to the stage to demonstrate a new level set in the creepy Church of Unitology on The Sprawl, a devastated lunar city that acts as this sequel's setting. It ended on a spectacular cliff-hanger, as protagonist Isaac Clarke avoided being sucked out into the vacuum of space by quickly pulling out a hatch in the floor, which unfortunately sent him tumbling down a chute to meet with a giant monster down below. Papoutsis picked up this cliff-hanger the next day at the Sony press conference, playing for another few minutes in which Isaac managed to escape the zombified beast in a moment of cinematic desperation you have to see to appreciate. Yet after all that, EA invited us over to its booth to have another look at the press conference demo and see a few things that weren't shown onstage. 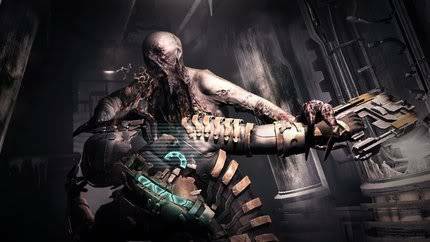 Previous Coverage: Here is our impressions piece from Dead Space 2's pair of press conference appearances and the first look at this sci-fi horror game posted back in May. What's New: While the two stage demos were heavy on action and dramatic flair, the 10 minutes leading up to those parts focused more on the game's atmospheric and cerebral side. Early on, Isaac starts in the bottom of a big, silo-like room. We're told he has to get up to a platform way up high to access an elevator. Getting there requires some serious puzzle solving. There are a series of rotating rings zipping around an energy core at the base of the room. These rings power the room's gravity--the very force that Isaac has to shut down to get up to the top since there is no other way around. We won't spell out how to solve it, but it does involve a terminal-hacking minigame, using telekinesis to slow down the rings and then taking to the air once zero-G is triggered. Isaac is sporting some new flaps on his suit that let him propel through the air in a controlled manner instead of just launching from one end of the room to the other like in Dead Space. This should make for zero-G puzzles and obstacles that are trickier than ever, like having to deal with a giant, spinning fan in the middle of the room. We're looking forward to seeing how Visceral Games adds some complexity to these sequences of flying through the air manually. What Has Changed: Nothing. It has been only a couple of days! Final Word: Dead Space 2 looks great, and the stuff that we saw most recently assuaged any lingering fears that this would be a more run-and-gun, action-oriented affair than the original. 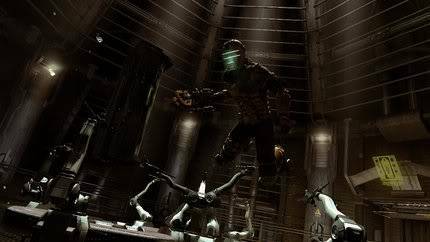 Stay tuned for more Dead Space 2 coverage leading up to the January 25, 2011, release.